No one wants a wet, musty, moldy basement, but this problem is all too common in homes across the country. Use these tips to prevent moisture problems in the basement that can lead to mold growth. A wet basement can be caused by two sources: high indoor humidity that condenses on cold surfaces and water that seeps in from outside. To determine whether one or both problems are to blame for your wet basement, tape a sheet of aluminum foil to your basement wall and check it after a few days. If moisture has condensed on the outside of the foil, your problem is excess indoor humidity. If moisture has accumulated on the wall behind the foil, water is leaking in from outside. Below, we’ll explain how to solve both sources of wet basements. Seal leaky ductwork and dryer vents that run through the basement. For long-term results, use foil tape, not duct tape. Insulate exposed plumbing with foam insulation. Add an exhaust fan to the basement bathroom and make sure everyone uses it when they shower. Keep the basement windows closed during humid weather. Run a portable dehumidifier to decrease basement humidity. Insulate the basement walls to prevent water condensation. You’ll want three layers – 3/4-inch rigid insulation, 1 1/2-inch rigid insulation and NOTE: Don’t insulate the walls if water is leaking in from outside, or this will create a mold problem behind the insulation. Increase the slope of the ground around your house to guide rainwater runoff away from the foundation rather than toward it. Add gutters if you don’t already have them and extend downspouts, so they deposit water four to six feet away from the house. 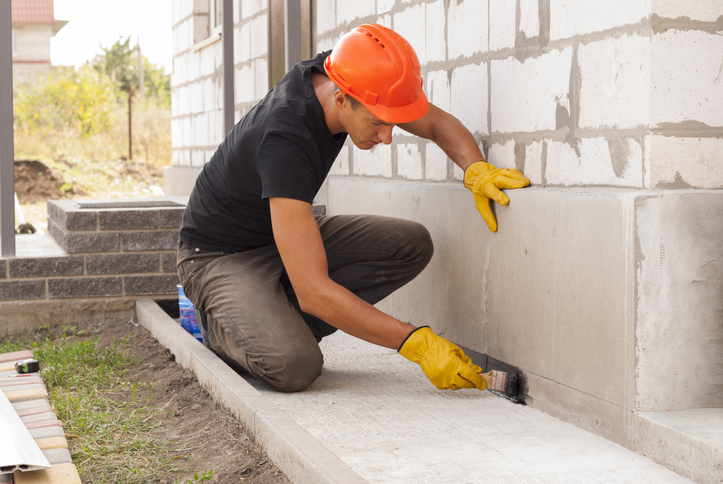 Plug up holes and cracks in your concrete foundation walls with hydraulic cement. This expands as it sets to seal up the leaks for good. Paint on a waterproof coating to fill porous concrete or masonry foundation walls. The goal is to fill every pore to create an unbroken waterproof membrane, so brush in every direction and add a second coat for good measure. Install a sump pump to remove flood water that rises toward the foundation floor. This upgrade can do wonders for preventing a flooded basement. Install drainage tubing below the basement floor to work in tandem with your sump pump. Install drainage mats on top of the concrete basement floor and below the carpet or other finished flooring material. If you need help implementing these tips to keep your basement dry, or you currently have mold and moisture problems, DKI Services can help. We are North America’s largest disaster restoration contracting organization with 45 years of experience. Our certified contractors can treat water damage and perform mold remediation as needed to restore your home. For answers to your questions, or to schedule services, please contact us at 877-533-0210.